Central Queensland is expected to receive some of the best rains for months from today. It is a much needed rain event and perhaps the first signs that the weather systems are changing away from the dreaded El Nino pattern anticipated earlier in the long range forecasting. 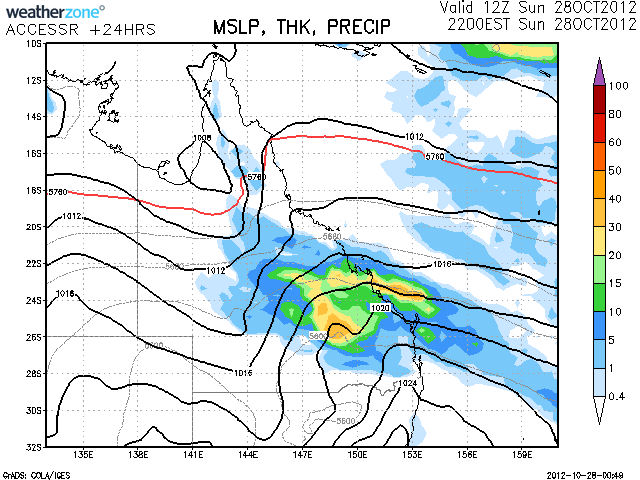 Up to 40mm of rain is expected in some areas with another 30mm on the following day over the Central Highlands. This will assist in easing the daily fire weather warnings some of them severe. 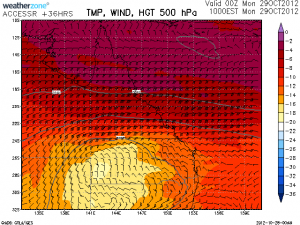 I personally was getting concerned that had some of the stronger hot windy periods entered Queensland and particularly NSW where it was more likely, there were going to be the possibility of near catastrophic conditions. Let's hope more rain will follow. Storms would be expected to begin during the day and spread westwards as the afternoon progresses in parts of central and western Queensland leading to the rain event further east. 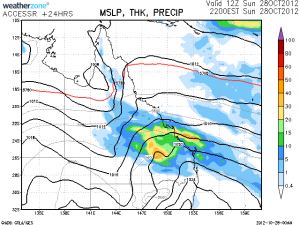 An unseasonal cold pool overlaying a surface heat trough and moisture pumping in from the Coral Sea coinciding over central Queensland over the next couple of days is responsible for this event. Emerald and Longreach radar already showing some activity this morning. Yes, some lightning all night in those districts though nothing severe. That will probably change this afternoon – the forecast profile is quite nice west from Emerald. Have you got the latest soundings for that area? Post it here? Some decent storms that occurred on Emerald radar tracking along a boundary in the region. Seems like the warnings were confined predominantly for south western Queensland this afternoon and for several hours. Anyone see anything decent on radar? I notice some very extremely low dewpoints today in SA of up to -27! Hopefully these won't be transported east in the next few days. Actually at one point the difference between wet and dry bulb was 61.6 degrees!